I don’t want you to think I live a life of decadence, surviving on biscuits and sweets alone. I dooo eat vegies as well as all the wonderful, sweet, yummy things I tell you about. It is just that steamed vegies are not a great post topic, not like cinnamon buns, for example. Now, cinnamon buns are worth posting about. This recipe produces a soft, fluffy bun. Very nice, especially with all that sweet icing on top. They are not hard to make and are very impressive. You will even impress yourself, so give them a go. The recipe is from Peter Reinhart’s Bread Baker’s Apprentice. As it is an American book, I have converted the ingredients into metric which is why some of the quantities are a bit strange. *These are 15ml tablespoons. If you are in Australia, please check your measuring spoons. If your measuring spoon is 20mls, use 1 x 20ml tablespoon and half a tsp of cinnamon. If you are American: this is real cinnamon not what is labelled “cinnamon” in your supermarkets. Please check you are not getting cassia. I believe you can buy real cinnamon in Asian or Mexican spice shops. Cream together the butter, salt and sugar until light and fluffy. Add the egg and lemon essence, mix well. Add the flour, yeast and milk and mix on a low speed until the dough just comes together. Hold back about one cup of flour and add it slowly to the dough as you knead it. I used about 550g but the amount you require will depend on the flour you use and whether you use milk or buttermilk. I like it so that during the kneading, the dough clears the side of the bowl but does not clear the bottom of the bowl. At the end of the kneading time, it may also clear the bottom of the bowl, but not necessarily. Knead on medium speed for 10 minutes (or 12 – 15 minutes by hand) until the dough is smooth and stretchy. Lightly oil a bowl, put dough in bowl and spray a bit of water on the dough. Spray plastic wrap with water and oil then cover dough with plastic wrap. Ferment at room temperature for approx 2 hours or until the dough doubles in size. Spray oil onto bench. Lightly flour your rolling pin. Gently roll out your dough to form a rectangle about 35cm x 30cm and about 1½ – 2 cm thick. Combine the cinnamon and sugar and sprinkle it over the surface of the dough. Roll dough (long side) into sausage shape. With the seam side down, cut into thick slices about 4½ cm wide. (I made 9 buns). Line a tray with baking paper and place buns about 1½ cm apart. (If you are lucky enough to have a tray with edges about 2 cm high and about the right size, use that as the buns hold their shape better with support. Put the buns close together because you want them to join up as they rise. Peter Reinhart advises that instead of proofing them, you can put the buns in the fridge for up to 2 days. If you do this, you need to take the buns out of the fridge 3 to 4 hours before you want to bake them to allow the dough to get back to room temperature and then to rise. Bake for 20-30 minutes (I think I did about 25 minutes – you don’t want them too brown). Allow to cool before icing. You will note in the photo that the icing ran – the buns were still warm when I put it on. Who can wait that long? Slowly whisk in enough warm milk to make a smooth paste. Drizzle over the cooled buns and EAT. This entry was posted in Bread, Commercial yeast and tagged Cinnamon scrolls, Sweet buns by Glenda. Bookmark the permalink. 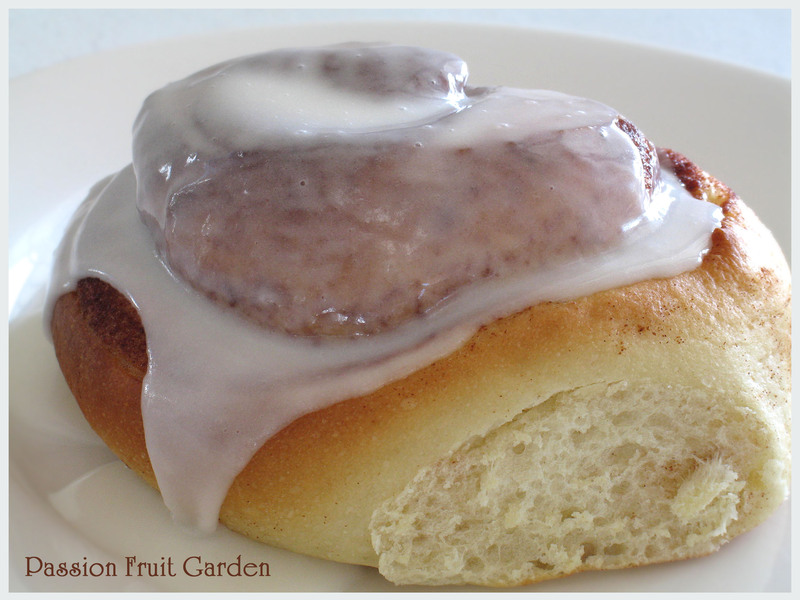 That’s a very good pic of the bun – nice! I make a lot of those (with Splenda), but I seem to make the same mistake every time: I always want to use more filling than I should – I can’t seem to break that – I also have trouble making them w/o adding dried fruit and nuts – and it’s been a long time since I drenched them in icing either. Hi Doc, Many would argue that the icing is the best bit. They are good with fruit and nuts but better, I think, with cinnamon and sugar. Hi Tandy They were very yummy.